Home/Digital Learning Day/Stay Connected To Digital Learning Day All Year Long! CANeLearn continues to encourage Canadian e-learning programs to participate in Digital Learning Day. Digital Learning Day (DLDay) 2019 has come and gone, but we at the Alliance for Excellent Education (All4Ed) will be sharing tools and resources between now and DLDay 2020 to help you stay plugged in. But, before we start thinking about DLDay 2020, thank you for a super successful DLDay 2019! DLDay 2019, held on February 28, created a wave of inspiration felt from coast to coast. Across the United States, more than 2,300 classrooms, schools, libraries, and districts held events to showcase how effective use of technology paired with great teaching can transform classrooms and improve student learning. Wondering How You Can Lead Innovation and Change? For digital learning to thrive, school and district leaders need to create conditions that empower teachers to take risks and try new things. But there’s also a critical role for librarians, instructional coaches, and teachers, who can lead this innovation through collaboration. If you missed these DLDay webinars, hosted by All4Ed and Future Ready Schools® (FRS), get caught up via the links below. When students enter school, they don’t leave part of themselves at the door. Instead, students walk into class carrying their cultural and community values with them. Recent findings from neuroscience, cognitive science, and psychological research provide a more in-depth understanding of why school culture matters for each student and why it especially is important for adolescent students to learn in environments that are safe, supportive, and culturally responsive. 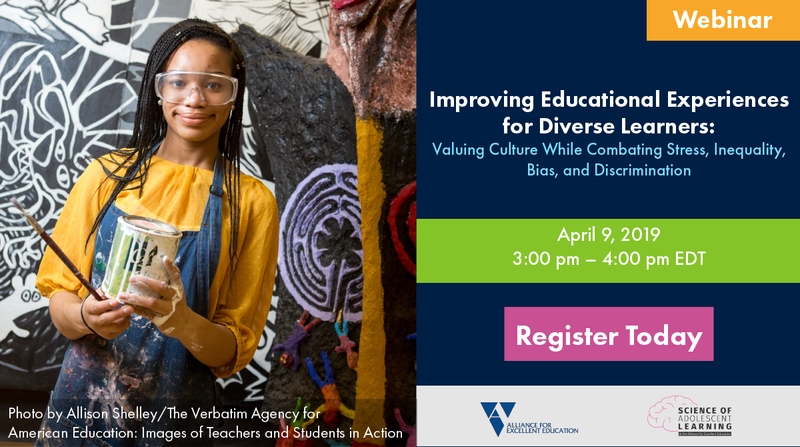 In this webinar, panelists will explore how educators and school leaders can use a more comprehensive understanding of student learning environments to improve educational outcomes for diverse populations. to Each Other in Class? Are your students talkative in class? Are they paying attention to their friends and not engaging in the lesson? 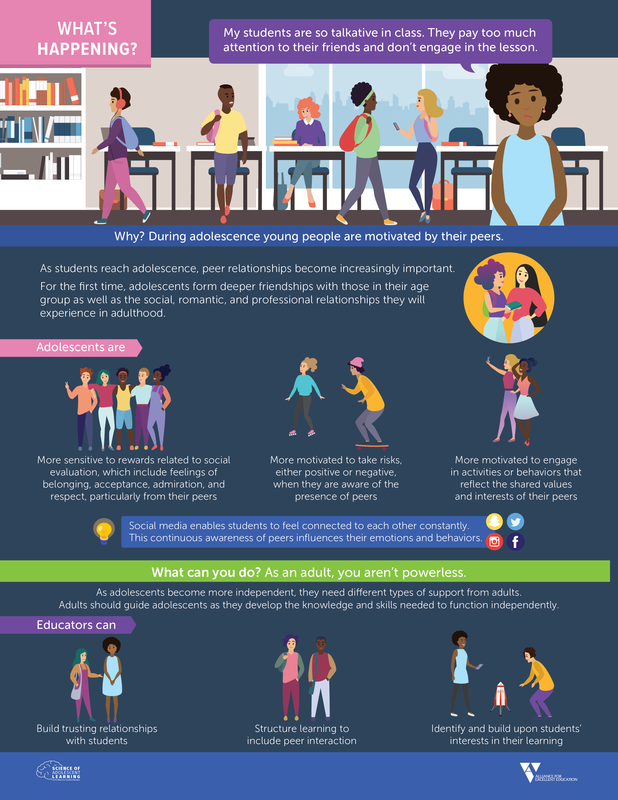 Check out this infographic to understand why adolescents are motivated by their peers, and what you can do as an adult to provide them with the proper support for learning and growth. Interested in learning more about how adolescents learn and develop and what it could mean for your classroom or home? Visit’s All4Ed’s Science of Adolescent Learning webpage to learn more and sign up for the mailing list. We know that DLDay only comes around once a year, but good teaching with the help of technology should be practiced and celebrated every day! If you are looking for ways to stay engaged, check out Future Ready Schools® (FRS), another All4Ed initiative, for ways to plan and implement personalized, research-based digital learning strategies. FRS has specific programs and resources for everyone, including librarians, technology leaders, instructional coaches, school principals, and district leaders! Follow Digital Learning Day on Twitter, Facebook, and Instagram.